Norwegian Cruise Line today announced its summer deployment for the 2013/2014 season with the addition of a third ship in Alaska. Norwegian Sun, sailing seven-day open jaw itineraries between Vancouver, British Columbia and Whittier, Alaska, will join Norwegian Jewel and Norwegian Pearl in Alaska for the summer of 2013, marking the first time the company has offered three ships in Alaska since 2009. For a more in-depth Alaskan experience, the company is also introducing land packages that can be combined with Norwegian Sun’s itinerary. The line’s summer deployment also features four ships sailing in Europe, including the continuation of two year-round, along with two ships cruising to Bermuda. These cruises* go on sale to Norwegian’s top travel partners and Latitudes Rewards members (past guests) today, December 6, 2011, and to the general public on Thursday, December 8. In Alaska, beginning May 20, 2013, Norwegian Sun’s northbound itinerary departs Vancouver , British Columbia on Mondays, and will cruise the Inside Passage, Glacier Bay and Hubbard Glacier and make stops in the Alaskan favorites of Ketchikan, Skagway and Juneau. On her southbound itineraries from Whittier, Alaska, the ship will cruise the Inside Passage, Sawyer Glacier and Hubbard Glacier, as well as making stops in Ketchikan, Skagway, Juneau and Icy Strait Point. Beginning May 18, 2013, Norwegian Jewel will sail a series of 18 seven-day Sawyer Glacier itineraries from Seattle, Washington every Saturday with stops in Juneau, Skagway, and Ketchikan, Alaska; along with Victoria, British Columbia. Norwegian Jewel not only offers a fantastic itinerary, but also brings extra fun for the kids with Nickelodeon family programming. The 2,394 passenger Norwegian Pearl begins a series of 18 seven-day Glacier Bay itineraries from Seattle, Washington every Sunday with stops in Juneau, Skagway, and Ketchikan, Alaska; along with Victoria, British Columbia. 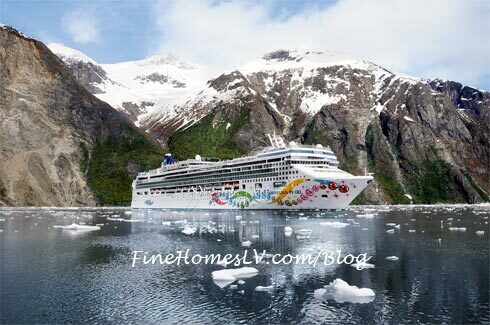 New for the 2013 summer season in Alaska are four Cruisetour options which provide the opportunity to combine a pre or post-cruise land package with Norwegian Sun’s cruises from Whittier, Alaska. Ranging in length from four to six days, the Cruisetours feature two nights in Denali National Park and are fully escorted by a local Alaskan tour guide for the most authentic experience possible. Highlights of the Cruisetours also include a stop at an Iditarod sled dog musher’s house (on four and five-night tours), along with a ride on the Alaskan railroad. More details on the Alaska Cruisetours will be available in early 2012. In Europe, Norwegian Epic will return for her third season, sailing seven-day Western Mediterranean itineraries from Barcelona beginning May 5, 2013 through October 14, 2013. The new Western Mediterranean itinerary features five ports of call in three countries — Spain, Italy and France — and a call to Palma, Majorca, Spain. Guests will also have the opportunity to sail round-trip from Rome ( Civitavecchia ), Italy or Marseille, France giving them the flexibility to choose the homeport that is more convenient for them. There is also a four-day Western Mediterranean sailing on May 1, 2013. Norwegian Star will make her debut in the Baltic replacing Norwegian Sun and will offer a series of 15 nine-day Baltic Capital cruises from Copenhagen, Denmark. Some highlights of this popular itinerary include two full days in St. Petersburg, Russia and an afternoon cruise of the Stockholm Archipelago upon the ship’s departure from Stockholm, Sweden. Rounding out the season, Norwegian Star will offer a unique 14-day Norway, Iceland and Faroe Island cruise from Copenhagen on September 19, 2013. Norwegian Jade returns to Venice on May 4, 2013 for the summer season and will offer alternating seven-day Greek Isles and seven-day Adriatic, Greece and Turkey itineraries. In the fall/winter, Norwegian Jade will reposition to Rome ( Civitavecchia ) and offer a series of eight 10-day Eastern Mediterranean and nine 11-day Mediterranean & the Holy Land beginning on October 26, 2013 through April 12, 2014. Beginning on April 17, 2013, Norwegian Spirit will once again sail the waters of the Mediterranean offering 12-day Grand Mediterranean open jaw itineraries from Barcelona, Spain and Venice, Italy through October 14, 2013. The comprehensive itinerary highlights the best of the Mediterranean with nine ports of call in five different countries including an overnight in Venice. On October 26, 2013, Norwegian Spirit begins a series of 20 nine-day Canary Island cruises. Guests will have the option to sail round-trip from Malaga, Spain giving them the flexibility to choose the homeport that is more convenient for them. In the summer of 2013, Norwegian Cruise Line will significantly increase its capacity in Bermuda with the arrival of its newest ship, the 4,000-pasenger Norwegian Breakaway, sailing a series of 22 seven-day cruises from New York, New York, beginning May 12, 2013. Departing on Sundays, the ship will spend three full days in Bermuda, along with three days at sea. The newly refurbished Norwegian Dawn will return to Boston, Massachusetts for the summer on May 3, 2013 and will sail a series of 22 seven-day Bermuda cruises departing every Friday. Pride of America will continue as the only US-flagged vessel sailing among all four of Hawai`i’s main islands. Because of popular demand for this itinerary, the company is opening Pride of America’s seven-day Hawai`i inter-island cruises departing Honolulu, Hawaii every Saturday through April 18, 2015**. Ports of call include: an overnight in Kahului, Maui; Hilo, Hawaii ; Kona , Hawai`i ; an overnight in Nãwiliwili, Kaua`i; and an afternoon cruise of the breathtaking Nãpali Coast . For a shorter cruise option, Norwegian Sky will continue sailing three- and four-day cruises to the Bahamas year-round from Miami through April 25, 2014. The three-day Bahamas cruise departs on Fridays and includes stops in Nassau, Bahamas and Great Stirrup Cay, Norwegian’s private island in the Bahamas , which has recently received $25 million in enhancements, including a new dining facility, marina and expanded beachfront. On Mondays, the ship departs Miami on a four-day Bahamas cruise with stops in Grand Bahama Island, Great Stirrup Cay, Norwegian’s private island; and Nassau , Bahamas. To book these new sailings, contact a travel professional, call 866-234-7350 or visit www.ncl.com. **Pride of America ’s cruises in 2015 will go on sale in January 2012.